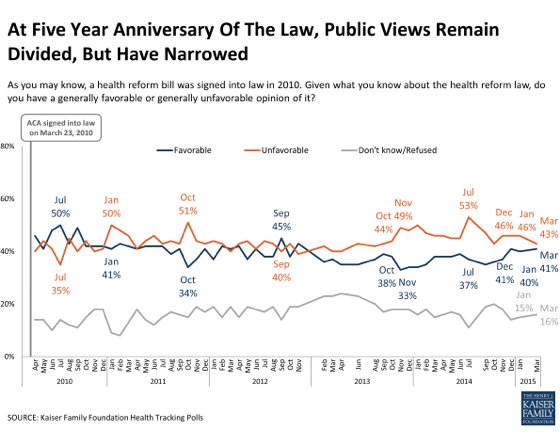 The Kaiser Family Foundation finds an uptick in favorable impressions of the ACA. Pollsters begin to explain what they think went wrong in Israel. And Americans grow more concerned about domestic terrorism. This is HuffPollster for Thursday, March 19, 2015. Little attention paid to Burwell - More from Kaiser: "The first week of March, the Supreme Court heard oral arguments in the King v. Burwell case...Even after these hearings, the case is not on the public’s radar. Just over half (53 percent) say they have heard nothing about the case and 25 percent say they have heard only a little, while about 2 in 10 (22 percent) say they have heard at least something about the case, a share that is somewhat higher than the 14 percent who said the same in January." More from U.S exit pollster Lenski - In a telephone interview with HuffPollster, Lenski explains that he found it “curious” that “you had three supposedly independent exit polls all coming up with results for every party within one seat of each other,” especially given the complex threshold and rounding rules involved in translating vote percentages into Knesset seats. He recalls working on exit polling for CBS in 1988 when three U.S. television networks still conducted exit polls separately. "We had differences [with] ABC and NBC in those years, and I think that’s healthy. If there were in [the U.S.] multiple exit poll results, each would be treated with the proper amount of skepticism instead of the belief that ‘that’s what the exit polls says, so that’s what it must be.’” Lenski also speculates that, after a thorough investigation, Israeli pollsters will reach the same conclusion as in probes of past polling snafus: "It’s going to come out that it’s a combination of small effects and in this case they all went in the same direction. So maybe they’re off by one seat because of the spike in turnout late in the day. Maybe they’re off an additional seat because of the non-response difference; the non-response went from 7 percent to 15 percent and was all Likud supporters, that could be a point there." Another factor or two could tack on few more seats and explain the full error.